Q: I have felt and at times seen ghosts throughout my life. I also feel people, their emotions mostly. I can tell if I need to go do something but then don't and then, “I knew I should have done that!” My granddaughter has been telling me for a few years she hears a lady call her name, and sometimes say “come here”. She is very sensitive to people and their emotions also. She is 11 years old today. I am wondering is this stuff normal for us both. Thank you. Children are especially sensitive to the presence of “invisible” beings around us, and are often able to see them or hear them. Sometimes these beings are relatives or family members who have already left the earth plane and are living in the spirit world. Spirits like to come around, hang out with their loved ones and watch what they are up to! Most of us don’t notice them. But sometimes a child will be able to see them or hear them. We also have many other spirits hanging around us. Some of them will be people that we know, but others could be people that were residing in our home before us, or just simply errant entities. They could be attracted to you or one of your family members, and decide to settle down around you. Usually spirits don’t bother us. And of course, your own spirit guides and angels, and those of the people who live with you, will always be present around you at all times! You WANT them to be around you! If a spirit realizes that someone in the home is sensitive to them and can see them, they might try to communicate. If the communication is neutral or pleasant and doesn’t cause anyone any distress, there’s no reason to get alarmed. On the other hand, if a spirit is bothering you, really bothering you, or a family member, you can, CLEARLY AND FIRMLY ORDER IT, in no uncertain terms, to CLEAR OUT and just LEAVE YOU AND YOUR FAMILY ALONE! You may also ask your angels to come and remove this unwanted entity from your home or from the presence of you and your unloved ones. By universal law, if ordered to leave, the being MUST go away. These types of beings (negative entities) are not allowed to stay with you if it is your will that it not remain with you. Occasionally, people have commented to me that they asked a being to leave and it did, but it always returns. NO BEING WILL STAY AROUND WITH YOU IF THERE ISN’T SOMETHING WITHIN YOU THAT IS ATTRACTING IT. You might unconsciously have a reason for keeping this being around you. A lot of times, having an unwanted visitor around serves us as the perfect excuse to not do something that we know that we have to do, but we don’t want to do, or to not face something that we have to face. It could also happen that the being is simply attracted to some negativity within you. If you clear that negativity out of you, the being will leave. It’s like, if you are being bullied at school, that is because there is something about you that attracts bullies. Perhaps you are too nice. Or perhaps your family is from outside, and doesn’t receive much social support within your town, making them vulnerable to being ridiculed without anyone defending them. But if you strengthen yourself, learn to defend yourself, perhaps learn some martial arts, then you become unattractive to bullies, and they will go off to bug someone else. I've received quite a few queries about who is that cool psychic reader that I praise in this post on Coolest Psychic Readers. 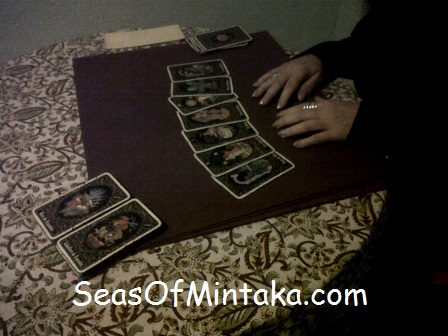 Many people have asked me about her, and about whether they can get a reading with her personally. Or whether she gives readings over Skype or the telephone. What I can tell you is that her name is Noemí. She's from Cuba and she has been reading the Tarot all her life, since she learnt this art from her mother when she was a little girl. I don't know if she gives readings over Skype or the telephone. As far as I'm aware, she only gives readings in person at her little, round, gaily-painted table. She does give readings over the telephone within Spain, however. She welcomes and loves to receive visitors (ie. clients), but it would probably be quite difficult for you to receive a reading from her in person, unless you're in Spain, where Noemí (and I) lives. The esoteric shop where she usually works is temporarily closed...... or perhaps forever. I don't know. It hasn't opened in months. I can understand that you would like to get a reading with her. She is definitely cool! As I've explained frequently, I no longer like to get psychic readings very often to "predict the future", because I believe that WE CREATE OUR FUTURE. However, sometimes I like to visit Noemí just because of her warm, fuzzy, caring energy! I’ve tried writing to the email address she provides (just click on her Google profile “Brujita Cubana” to find her email address), and she has never answered me back. I’m really not too sure where she could be wandering about lately, since no one that I know who knows her has heard from her for the past year or so. At any rate, if you’re good at Spanish, her blog is quite interesting and she offers some luscious nuggets of information. So even if she is no longer giving Tarot readings, it’s worth your time to hop over and check out her blog. Sometimes readers ask me whether I am still looking for “guinea pigs” (hehe) for Akashic Records readings practice. Actually, I no longer need “guinea pigs” for this particular modality, since I’ve already finished the course and received Certification as a Certified Soul Realignment Practitioner from Andrrea Hess several years ago. However, I personally like to be constantly expanding and learning new things. This means that every once in a while I will take up some new practice or learn a new modality. And when that happens, of course, I do need practice clients to work with, for free. I’m currently considering a few new techniques that I’d like to offer through this site. I haven’t made any definite choices yet. But when and if I do, if I need practice clients, I will DEFINITELY for sure let all my beloved Subscribers in on this before telling anyone else about it, and offer the opportunity to be my practice clients to my Subscribers first. Only if I don’t receive enough responses, then I will offer it to the public in general on the website. So if you have not yet subscribed to this website, you can do so by filling in the box in the upper right-hand corner of this page. And receive all new articles and posts in your inbox, as well as the occasional special offer that I might make available only to my beloved Subscribers.